HERE ARE A FEW TIPS ON HOW TO KEEP YOUR GARDEN LOOKING GREAT! Till the garden this fall. Exposed soils freeze and thaw over the winter and help to break up that heavy soil. Add a layer of compost, pine soil conditioner, manure, or finely ground leaves and grass clippings before you till. Fall is the best time to apply most soil amendments. Have your soil tested? Many adjustments can be made this fall. Make sure you have proper soil moisture for your large trees, shrubs, perennials, and any newly planted plants. It is critical to the success of your plant in making it through the winter. If you have questions, read our Watering Guide or ask our horticulturalists. Fall is the best time for planting most trees, shrubs, evergreens, and perennials. October thru November is the best time for spring planting bulbs.Plant spring flowering bulbs like tulips, daffodils, crocus, hyacinths, anemones, alliums, etc. Plant several in pots for bringing indoors early next spring. Dig, clean and store summer bulbs (cannas, tuberous begonias, gladiolas, caladiums, etc.) in a cool dark place for replanting next year. Let the early light frosts kill the tops, then dig and store away. Brighten your holidays by planting amaryllis and paperwhite bulbs. They take 6 weeks or so to flower, so plan accordingly. Plant them on staggered times to have colors all winter long. Plant herbs for growing indoors over the winter. Transplant trees and shrubs and perennials that you would like to move. Dig and divide most spring and early summer flowering perennials as needed. Late summer (August thru Sept.) is the time for iris and peonies. Remove all dead foliage from perennials. Clean up left over annuals and veggie plants by cutting them off and leaving the roots. They will break down and add organic matter back to the soil. Place disease free dead foliage in the compost pile. For a cleaner start next year, clean up around fruiting trees and plants to get rid of fallen fruits, diseased leaves, and branches. Apply a pre-emergent to help prevent winter annuals from germinating (chickweed, henbit, purslane) in landscape beds. Provide deer protection (if needed) by protecting younger trees (3″ diameter or smaller) with a trunk protector and protect susceptible deer plants by applying DeerScram, Liquid Fence, or Repels All or use a nylon netting coverage. Evergreen will shed inner needles in the fall but be sure to keep them watered thru the fall season. Later in the fall, spray evergreens (as needed) with WiltStop for greater winter protection. You can also spray rose canes and smaller Japanese maples for added winter protection. If needed in late fall, do last minute ‘hand trimming’ of evergreens, tree limbs, etc. Be sure to save severe pruning for late winter/spring. 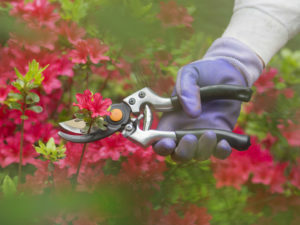 In the fall, pruning spring flowering trees will reduce or eliminate spring flowers. Prune after to preserve spring flowers. For roses, wait until late in the year after they have gone dormant and the soil is close to frozen or near frozen. October is the best time to go after those broadleaf weeds in the landscape and lawns. Using a weed killer in the fall works better as the weeds are taking in nutrients and storing them in their roots for winter, so they take in the weed killer as well. Spot treat the weeds as needed. Remember, if you have new grass, make sure it has been mowed at least 3 times before applying a weed killer. Feed the trees in late fall if needed. Vertical mulching or soil injection with a Ross Root feeder works great. If feeding evergreens, wait until late fall and use ½ normal rate. Spring is best for feeding evergreens. Winter mulching should not be done until the ground is frozen, or at least down into the lower 40’s or colder. Remember to keep mulch away from the bottom of tree trunks, and for critter protection away from the base of most landscape plants. Bring tropical plants that have been outside all summer, indoors before night temperatures reach below the 50’s. Acclimate them in the shade for 10 days before bringing indoors. Check the pot and soil for any critters. If you are overwintering planted pots, move them to unheated garages, sheds, window wells, etc., after they have gone dormant and the temperatures have gotten consistently cold. Keep these plants cold to remain dormant all winter. Water once per month.